When it comes to journaling, there are countless benefits. From stress relief, to improved focus, writing has many mental benefits that can translate into a healthier, happier you. Many of us would love to reap these benefits but aren’t sure how to get started with journaling. Writer’s block can make it hard to stay motivated to pick up your journal each day and sometimes some serious inspiration is necessary. 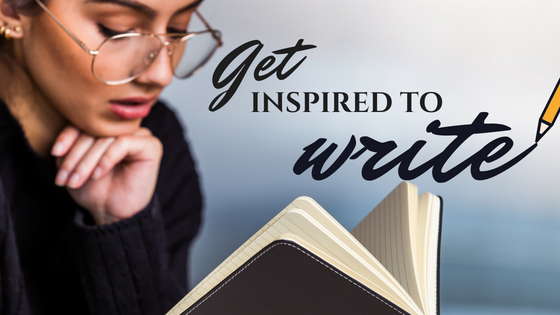 A little writing inspiration can go a long way and you’ll be surprised at how much inspiration is available to you on a day to day basis, you just need to know where to look! Music has a unique ability to take us away to a different place or different time. When you’re feeling uninspired put on your favorite playlist or browse a new playlist and see where the music takes you. Art is another outlet that can lead to writing inspiration. The great thing about art is that it can take so many different forms. From paintings, to photography, to dancing, art can be found all around us. When you’re feeling uninspired take some time to check out your favorite type of art or check out something new. You’re sure to have some new ideas for your journal in no time. The internet is endless, and you can find information and topics on just about any subject you can think of. If you’re looking for some new ideas for your journal, check out some forums on some topics that you’re interested in or pick a topic at random and learn something new. Knowledge is power, and you’ll end up with a journal full of interesting information. Joining a writing group is a great way for new and experienced writers to open their minds to new topics and ideas. No two minds are alike and when you get together and collaborate with other people your mind will be influenced by possibilities you might never have thought of before. The great outdoors can bring on some serious inspiration. Regardless of where you are (desert, mountains, beaches, lakes) you can find inspiration and beauty in nature. Another great thing about being in nature is the relaxation and peace you can find simply by being outside. Travel is an amazing inspiration for writing as each destination brings something new and unique to the pages of your journal or notebook. Write about your adventures for the day and sights you saw. Your journal can also double as a scrapbook as you can add photos and pieces of your travels such as train tickets, stamps, and foreign currency to remember your trip. Dreams make great writing inspiration, especially since dreams are truly unique and authentic. Write down your dreams or what you can remember from them (often we’ll awake with only bits and pieces of our dreams). After you’ve written them down, check dream books or online forums to decipher possible meanings and write them down in your journal or notebook. If you’re still struggling with finding your writing inspiration Piccadilly has the perfect solution for you. Piccadilly’s’ Inspired Journal is filled with inspirational, thought provoking quotes that will have writing in no time.